Since joining the Foodie Exchange I’ve received a myriad of delightful edible treats from fellow food lovers across the globe. 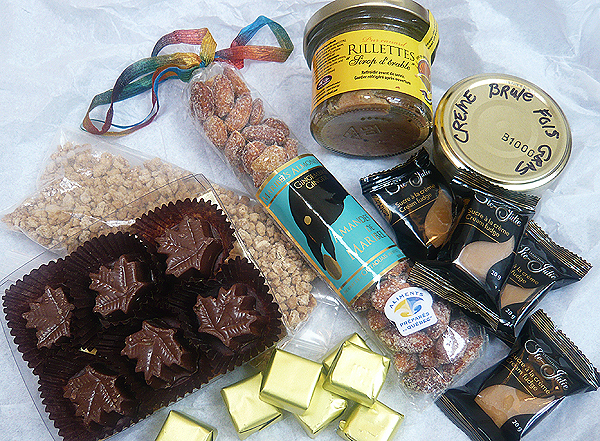 The latest package, which arrived from Quebec early last week, was really special as Liliana (My Cookbook Addiction) had filled it with a well-considered selection of unique sweet and savoury Québécois food products that she picked up while at the Montreal Crossroads of Flavours festival. Upon opening the parcel I immediately got stuck into the beautifully wrapped bag of Ginger Almonds from Amandes de Maribel. The roasted almonds lightly dusted with specks of crystallised ginger were delicious and ridiculously moreish. The intriguing Crème Brûlée Foie Gras and Maple Duck Rilettes were cracked open a few days later at brunch, and eaten with some crusty bread. The foie gras had a delicate mild flavour with a light, almost mousse-like consistency. The rillettes were sweeter (due to the maple syrup) but not overwhelmingly so, and we enjoyed both immensely. I’ve yet to open the remaining sweets, but I know the Maple Chocolates well as I used to visit cousins in Vancouver every other summer as a child, and they always had a box ready for me to bring home – those will certainly bring back floods of memories when I get around to devouring them! I’m also eager to taste the cream fudge and foil-wrapped maple candies, both of which I’m sure will be just heavenly. As for the maple sugar, I actually have no clue what to use it for (baking, perhaps?) so I’m hoping for some recipe suggestions if anyone has any! All in all a really great swap and I especially liked how so many of the products were new to me. Thanks Liliana, you put my cadbury’s, biscuits and tea-filled bundle to shame! ~ by gourmettraveller on April 9, 2010. Amazing, I am from Montreal and have met Liliana, she is a wonderful person and did a great job with the basket she sent! I’m jealous, everything looks so delicious! The maple sugar is really good as a sanding sugar for cookies and baking, also in tea. Please describe what the creme brulee fois gras tasted like! That caught my attention immediately. I wonder what items I would put in a Bulgarian exchange package! I so glad you liked the package! I use the maple sugar as a filling for cinnamon rolls or a coffee cake. It can also be sprinkled on oatmeal and yogurt. I make maple sugar pie, and it is one of my family’s favourite desserts, as well as being really easy.